It’s taken a while to get to this point, with some bumps along the way, but developer Peter Kofman is satisfied that the reworked plan for Mirvish+Gehry Toronto will deliver the city a landmark development the likes of which it’s never seen. Unveiled to much fanfare in 2012, Canadian-born architect Frank Gehry’s initial design for the project called for three super-tall towers (95, 90 and 85 floors, a total of three million square feet), and levelling all the buildings on the David Mirvish-owned King Street West site, including the Princess of Wales Theatre. It may have been a homecoming for the iconic architect, the first tall towers Gehry has designed in the city where he grew up, but his preliminary vision met with pushback from city staff. “They didn’t like it much,” Kofman says in an interview with Epoch Times at the King Street HQ for his firm Projectcore Inc., located on the site of Mirvish+Gehry Toronto. The development team was directed to rethink the proposal, which it did over six months via a collaborative design and urban-planning exercise with staff and council, and consultations with local stakeholders in a working group process. The design that’s resulted features two towers—one 92 storeys, the other 82—with 1,950 residential units and an enhanced public realm at the base, including an art gallery housing the Mirvish Collection and an OCAD University facility (parts of the original plan). Crucially, the new plan preserves the Princess of Wales and protects many of the site’s architecturally significant heritage components, including the entire Eclipse Whitewear Building and the façade of the Anderson Building. While the form might have changed, it’s still a Gehry masterpiece in the making. The towers, with dramatically undulating surfaces of glass and stone, will have a “sculptural relationship” to one another, with the form of the space between them as important as the towers themselves, according to a visual guide to the revised design. 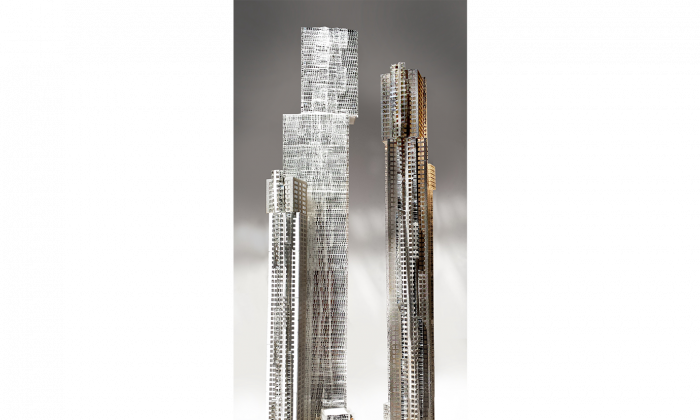 Each of the towers will have one facade in glass (the south side of the west tower and the north facade of the east tower), with the reversal giving the impression of a dynamic rotation. “The towers dance with each other,” the guide says. Gehry’s work generates an interest that’s “almost unparalleled,” one of only a few designers in the world who inspire architectural tourism. “People are really moved by seeing his buildings,” says Kofman, predicting Mirvish+Gehry Toronto will become an essential stop on the tour. At the base of the buildings, the goal is “to get as much life on the street as we possibly can,” Kofman explains. Ed Mirvish Way, which runs through the centre of the site, will be turned into Ed Mirvish Square, a flexible urban space between the two towers for public events. There will be retail in the two six-storey podiums—potentially restaurants, cafes, and a prepared-foods grocer—that’ll tie in with the various activities planned for the adjacent John Street Cultural Corridor. The project will include office space as well. In addition to the art gallery housing the Mirvish Collection, OCAD will be taking two levels at the base of the east tower for its Princess of Wales Centre for Visual Arts, a learning facility with studios, seminar rooms, galleries, a public theatre, and a lecture hall.